My epic wax carving project is finished! 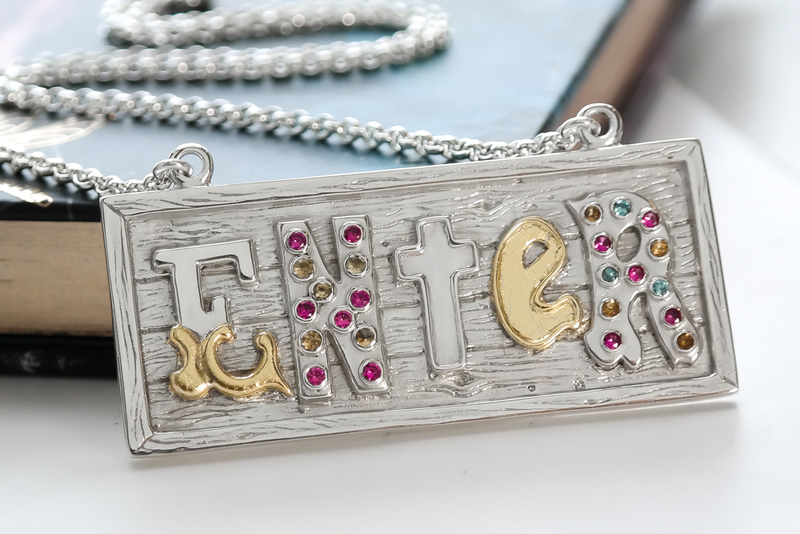 Inspired by the neon art of God’s Own Junkyard, I wanted to make a jewellery version of their iconic Enter sign. Starting with a block of wax, I cut a slice off with my tiny sawblades (oh how I wish I had a little bandsaw!) and carved out the centre to leave a frame around the edge. Then I divided the frame up into planks and added wood texture with a pointy wax carving tool. Now for the fun bit – cutting and carving each of the letters individually and attaching them to the frame. I learned from my last circus letters project, drill the holes in the wax first before casting into silver! For the past couple of years I have been using a little battery operated wax pen to melt my wax, but it just wasn’t cutting it for this project. I’ve lost count of the number of batteries I’ve been through! I decided to invest in this cute little electric wax pen instead, which is marvellous! And here it is, all ready to cast into silver. Back from casting, it ended up being pretty heavy. A subtle piece of jewellery it is definitely not! Then came cutting tiny bits of silver tubing and a whole lot of soldering to add the settings. Many hours of cleaning up and polishing later it was ready for the gemstones to be set. I’ve used two colours of citrine, blue zircon and lab grown rubies to mimic the colours of the lights. 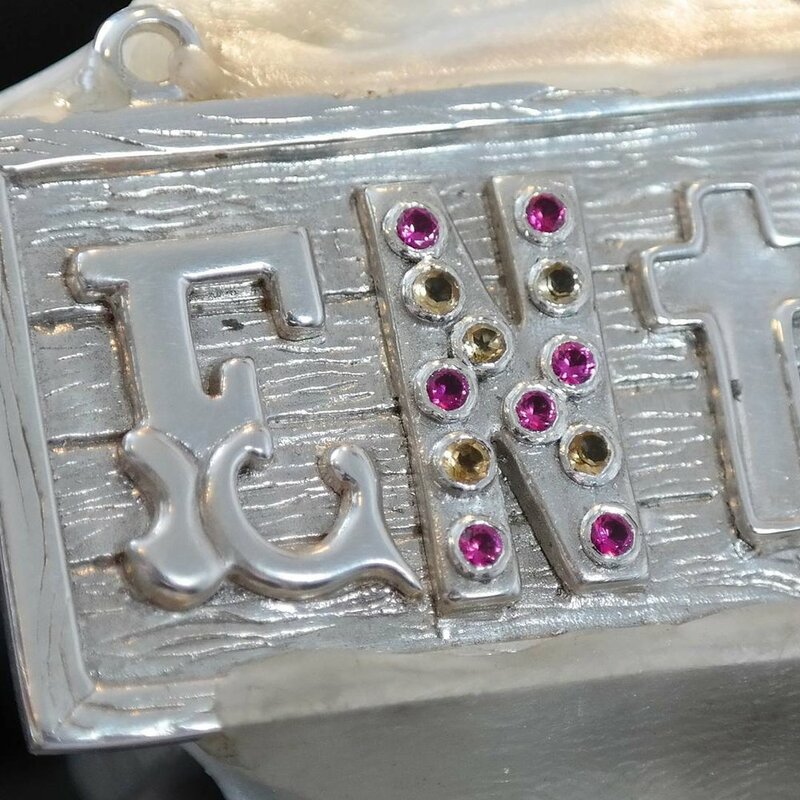 The stones in the ‘N’ are 2mm in diameter and in the ‘R’ they are 1.75mm. My eyes were pretty done in after setting them – I think I may need to invest in one of those magnifying visors! I failed to count up how many hours I spent making this, but it was a lot! I’m so pleased with how it turned out. I started it to practice wax carving, which I’ve definitely done, but it has also led to a whole collection inspired by the art at God’s Own Junkyard. My ‘Enter’ sign, along with other pieces from the new collection, will be on display at Stow Brothers estate agents as part of the E17 Arts Trail between 3 and 18 June 2017.